Neighboring rural villages nestled on the banks of the Mekong River in Laos seem to blend together as you pass by, and it may be easy to assume that these communities share similar fishing practices. However, we discovered this is not always the case through a fisheries study that involved the participation of fishermen themselves. Small-scale fisheries, such as those in Laos, are often dispersed in hard-to-access rural locations, and may require non-traditional approaches to fisheries monitoring. Participatory research methods directly involve fishers in the process, build on their local ecological knowledge, and are generally a cost-effective approach in these situations. 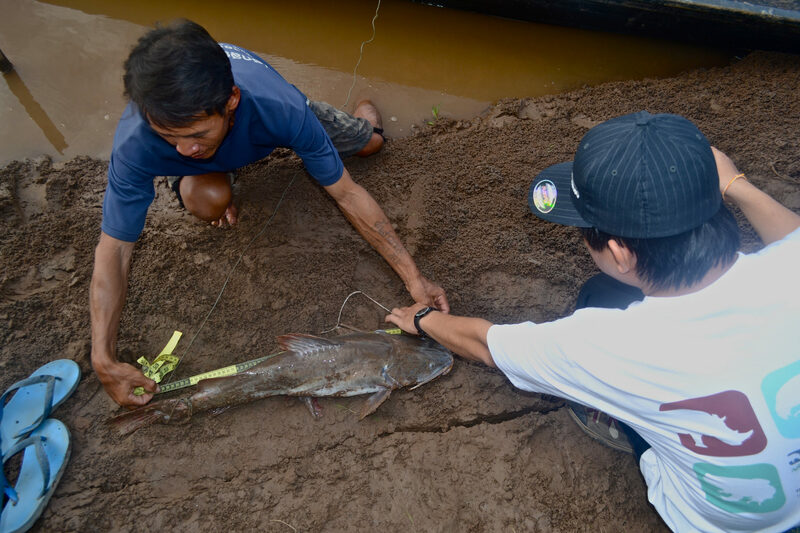 FISHBIO recently completed a final report on a pilot project we conducted to test participatory fisher survey protocols in two neighboring villages on the Mekong River in Sangthong District near the Lao capital of Vientiane. This project trained local fishers to gather data on their catch, which is essential for developing effective conservation and management strategies. The project also focused on collecting baseline information on Jullien’s Golden Carp (Probarbus jullieni) and thicklipped barb (Probarbus labeamajor), two commercially valuable fish listed as “endangered” on the IUCN Red List. 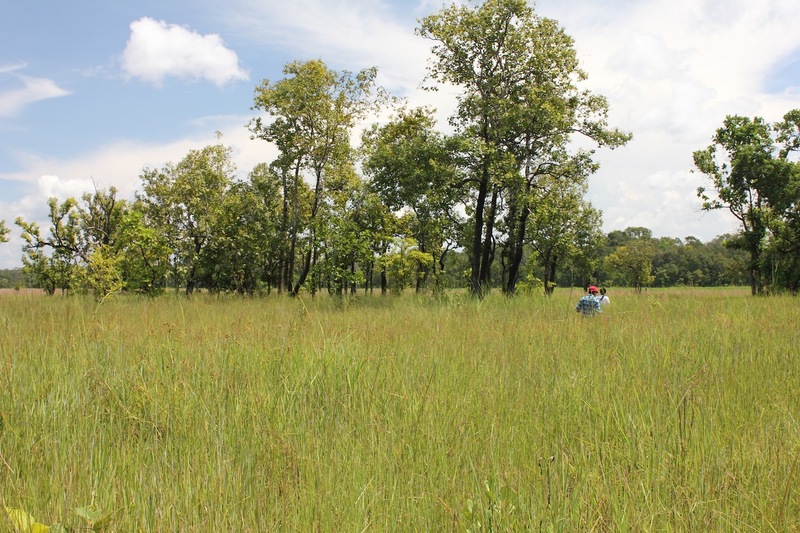 The pilot study spanned a three-month period in the Lao dry season between October 2013 and January 2014. FISHBIO staff led the study with assistance from District and Provincial Agriculture and Forestry Offices, and with funding from The Mohamed bin Zayed Species Conservation Fund and FISHBIO. The villages of Ban Sakai and Ban Ang Noi along the Mekong River were selected based on reports of nearby spawning habitat for Probarbus fishes. Many fishers in this area target spawning Probarbus because they fetch a high price across the river in Thailand. Five fishers selected as fisher technicians in each village were trained to collect data on their own catch. For this pilot effort, we focused on fishing practices that are predominately performed by male fishers in the mainstream rivers; however, it’s important to note that women also play an important role in Lao fisheries. The results of the study indicate that fishers in the two villages used different gear types, which made sense because the river habitats fished by the two villages differed considerably, despite their proximity. In Ban Sakai, there is a deep pool and rapids near the village, and the most common gear type was a bottom longline weighted down with rocks. In Ban Ang Noi, the river is shallow and sandy, which can cause disconnected off-channel pools to form in the dry season, and the most common gear type were nets (usually gill nets). The average daily catch per fisher ranged between 0.52 and 1.67 kg per day, which is higher than the average of 0.32 kg per day per fisher reported by the Mekong River Commission’s log book program, a similar participatory monitoring program in the region (Halls et al. 2013). Figure 1. 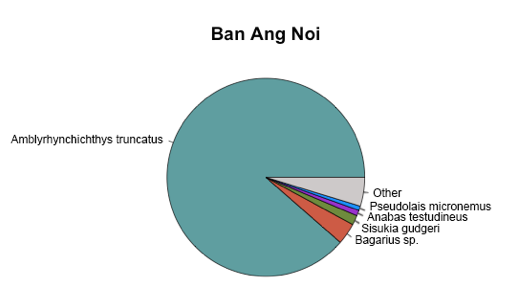 Species composition by number of individuals in the catch in Ban Ang Noi. Fishers reported catching more than 54 species (40 genera), and the composition of the catch differed between villages. Catch in Ang Noi was dominated by small individuals of the cyprinid Amblyrhynchichthys truncatus, which made up 89% of the catch by number of individual fish and 25% of the fish catch by weight (kg) during the study in this village. In contrast, this species only made up about 3% of the fish captured in Sakai, where various Bagarius catfish species were the dominant fish at 43% of the catch. Probarbus, our fish species of interest, were infrequently reported, making up only 0.43% (n = 19) and 0.41% (n=3) of the catch by number of individuals in Ang Noi and Sakai, respectively. However, it is notable that Probarbus made up 18% of fish catch by weight in Ang Noi. The largest individual recorded in the study was a Probarbus labeamajor that weighed over 16 kg, although the species can grow up to 70 kg (Baird 2006). Figure 2. 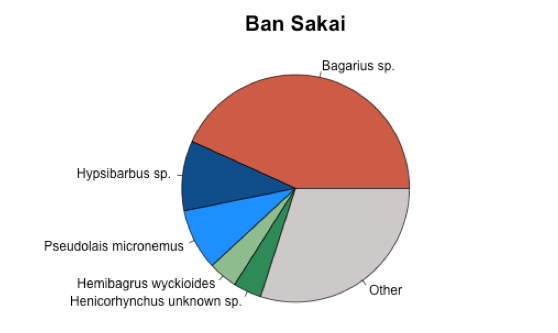 Species composition by number of individuals in the catch in Ban Sakai and Ban Ang Noi. During the closing workshop for this project, participating fishers expressed concerns about having enough fish for future generations. A fisher with more than 40 years of experience on the Mekong River reported he has only used gill nets for the past 10 years. Before then, he did not catch Probarbus and used traditional fishing gear, such as bamboo traps and hook and line. Similarly, Baird (2006) reports that before the early 1970s, Probarbus were generally abundant in Southern Laos, and large-mesh nylon gill nets were rare. However, Probarbus are now an important target fish in a gill-net fishery, and catch has been declining, suggesting declines in Probarbus in Laos may be associated with modernization of fishing gears. The communities are especially troubled by the lack of enforcement to address illegal fishing gears (electrofishing gear and dynamite), and are interested in establishing, enforcing, and monitoring fish conservation zones to better manage their community-based fisheries. 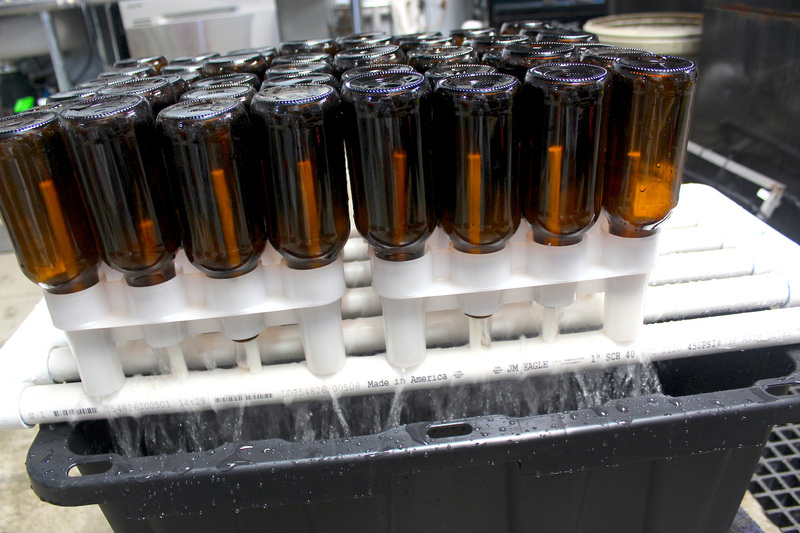 The first step toward improved management would be developing co-management committees and fisheries regulations. The information presented in this report can serve as a starting point for developing local fisheries co-management, which is a key part of FISHBIO’s work in Lao PDR. Watch our video about the project here.